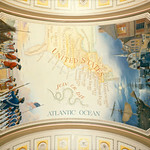 In 1993-1994 the third series of murals, based on artist Allyn Cox's approved designs, was executed in the western north-south corridor of the House side of the U.S. Capitol by EverGreene Painting Studios, Inc. Called the Westward Expansion corridor, it includes maps and scenes showing the growth of the United States from early exploration through the acquisition of Alaska and Hawaii. As in the corridors that Cox executed, the scenes on the vaults are set above illusionistic architectural motifs and relief sculpture. Each map in the vaults is shown in the cartographic style appropriate to its historical period. Jeffrey Greene, the head of EverGreene Painting Studios, verified the geographical and historical accuracy of Cox's preliminary sketches, developed new scenes compatible with Cox's concept, and then submitted detailed sketches and small-scale oil paintings of each vault to the Architect of the Capitol for the necessary approval. The corridor was formally dedicated on September 17, 1993, which was not only Constitution Day but also the day before the bicentennial of the laying of the Capitol's first cornerstone.